I used the banner border stamp from the Flip Flop Season stamp set and stamped it directly onto my card base using a few colors of ink – Duckling, Sunshine, Rosie Cheeks, Pale Blush Pink and Hollyhock. Next I die cut a circle using Simon Pierced Circles die and stamped large outline Hello using Sunshine ink. I also die cut a sunshine word for this project; I didn’t have suitable yellow cardstock so I used white and colored it using my Copic marker, I also added white foam tape to the back of my paper to die cut an instant dimensional and sticky element. I also stamped flip flops using Memento Tuxedo Black ink and colored them using Copics; added Sakura Glitter Pen on top for some shine. 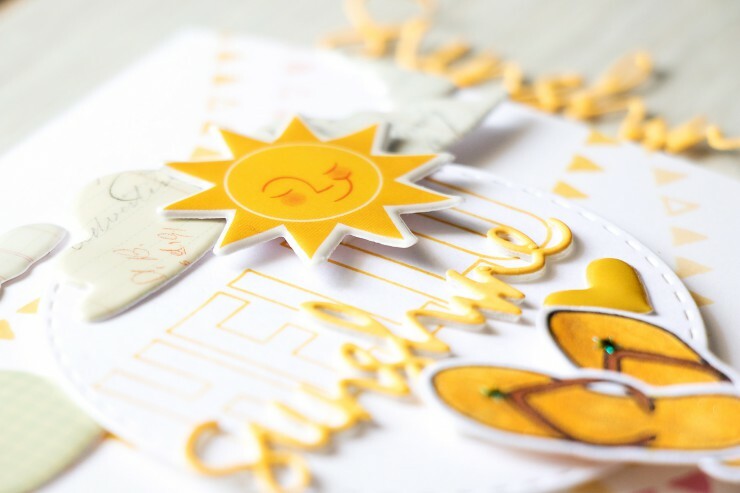 I dressed up my card using some puffy stickers from the kit – added a cute little sunshine, a few clouds and a heart. I also used the Martha Stewart Iridescent Stars to decorate my flip flops. I adhered them down using Multi Matte Medium adhesive from Ranger. Did you like this video? Please give it a thumbs up and share with friends. Thanks! Stunning card! So happy and sunny! It reminds me our hot weather now)))should go to the beach) Great card,Yana!!! it is hot indeed 🙂 thank you! So far, my favorite August card. I often don’t know what to do with border stamps. 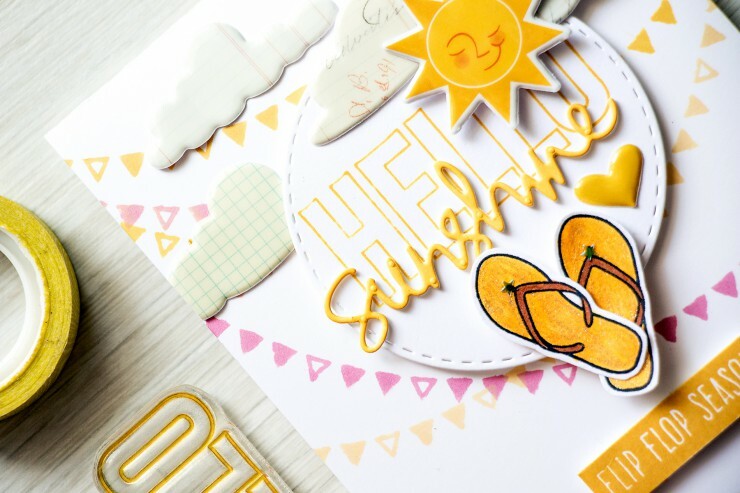 I just love the flip flop stamp, and your style is wonderful. Thanks for sharing. thank you so so much, Kim! Glad you like it! What a fun and fabulous card Yana! I love those happy colors! Such an adorable and summery card Yana! Love it! A lovely card and I love the yellow. Very refreshing! BTW, a great tip about using double-side foam tape stuck to CS for quick dimension. Very clever! Stunning card, I felt in Love!!!! At first I thought you meant you die-cut the Sunshine word and then somehow added tiny pieces of foam to it ( and I admired your perseverance!). THEN I realized you added the foam to the cardstock before cutting — that is a fantastic tip!